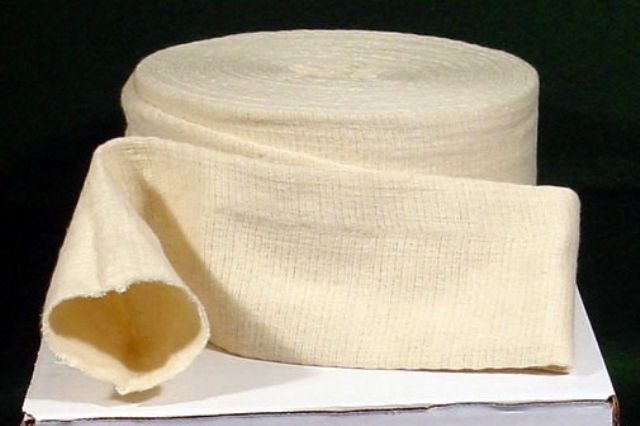 A high quality tubular bandage for support and continuous, even compression. Manufactured of a special cotton and elastomer blend. Tetra-Grip is a natural color bandage that is washable and reusable. Sold in 11 yard rolls in the following widths: 1 1/2", 2 1/2", 2 3/4", 3", 3 1/2", 4", 5", 7", 8" and 12" (see related products). Latex-Free. Each roll is individually boxed. 7021-A1 A 19 - 22 cm 22 - 24 cm 24 - 27 cm Fits infant feet and arms 1.5"
7021-B2 B 22 - 24 cm 24 - 27 cm 27 - 30 cm Fits small hands and limbs 2.5"
7021-C3 C 24 - 27 cm 27 - 30 cm 30 - 35 cm Fits adult hands, arms/legs 2.75"
7021-D4 D 27 - 30 cm 30 - 35 cm 35 - 44 cm Fits large arms and legs 3"
7021-E5 E 30 - 35 cm 35 - 44 cm 44 - 54 cm Fits legs or small thighs 3.5"
7021-F6 F 35 - 44 cm 44 - 54 cm 54 - 64 cm Fits large knees or thighs 4.0"
7021-G7 G 44 - 54 cm 54 - 64 cm 64 - 72 cm Fits large thighs 4.75"
7021-H11 H 54 - 64 cm 64 - 72 cm 72 - 86 cm Fits XL thighs and XS trunk 6"
7021-J8 J 64 - 72 cm 72 - 86 cm 86 - 96 cm Fits small trunk 7"
7021-K9 K 72 - 86 cm 86 - 96 cm 96 - 108 cm Fits medium trunk 8"
7021-L0 L 105 - 130 cm 130 - 149 cm 149 - 160 cm Fits large trunk 12"
MEASURE AROUND THE WIDEST PART OF THE EXTREMITY. PRESSURES ARE BASED ON COMPRESSION APPLIED AS A SINGLE LAYER. SELECT DESIRED PRESSURE AND MATCH MEASUREMENT TO DETERMINE SIZE NEEDED. This product is shipped from our warehouse in Niles, IL, USA. ALL returns must have prior written authorization. For item returns resulting from customer error, the items must be returned prepaid and must be in a resalable condition. Returns within 30 days are subject to a ten (10) percent restocking charge. Returns after 30 days are subject to twenty-five (25) percent restocking charge. We will not accept any returns after 180 days.